Wirecutter, Forbes, Wired, and Lifehacker rate our desk number one! Start designing your own UPLIFT V2 Standing Desk! We're honored to be named the "Best Standing Desk" by Wirecutter. We are also rated #1 by Forbes, Wired, Lifehacker, and many others. Click here here to see more reviews. We created UPLIFT Desk after listening to you; it's been our goal since the beginning to help every person and every office build the spaces that let them do their best work. Our team is dedicated to keeping our prices as low as possible, while holding our quality to the highest standards, so that you can create the long-lasting workstation you need. For more than a decade, we've been at the forefront of the standing desk movement, chosen by hundreds of thousands of offices. We have been manufacturing products with the best in locally and globally sourced components here in Austin, Texas, since 2002. We design all of our products so you can customize and build your dream office at an affordable price. Our aluminum and steel frames, reclaimed solid wood desktops, monitor arms, stools, task lights, and other products are optimized to work well together. It's time to UPLIFT your work day. Your desk is where you work and create, so it's important that it's built to your specification. That's why we offer a wide range of useful accessories and desktop materials. Choose from 100 percent recycled wood desktops in our Eco line. Or, consider a GREENGUARD-certified laminate desktop, which provides excellent value while being indoor-air friendly and environmentally sound. Want an upgrade? Try our bamboo, reclaimed wood, custom handcrafted solid wood, or L-shaped desks. More of a do-it-yourselfer? Add your own desktop to our 2-leg, 3-leg, or 4-leg frames to create a custom stand up desk. And when off-the-shelf options aren't enough, we'll happily work with you to make the custom height adjustable desk you need. Transform your existing workstation, or even your entire office, with our family of Standing Desk Converters from UPLIFT Desk. Simple and easy pneumatic adjustments bring your monitor and keyboard to your preferred sitting and standing positions seamlessly. They're perfect for use with fixed-height desks and cubicle workstations that could use personalized height adjustments without building from scratch. Once you've customized your perfect sit stand desk, take it to the next level with innovative accessories. Our ergonomist designs all accessories to enhance the functionality, quality, and value of your ergonomic desk. We have in-desk power grommets with convenient electric outlets, single and dual monitor arms with fingertip adjustability, task lights with personalized lighting levels, cable management kits with all the wire organizers you could want, and much more. And don't forget about our new Flexible Office accessories such as acoustic privacy panels. We've got it all! Have a desktop you just can't bear to lose? Or do you prefer to make your own top? We've got you covered. 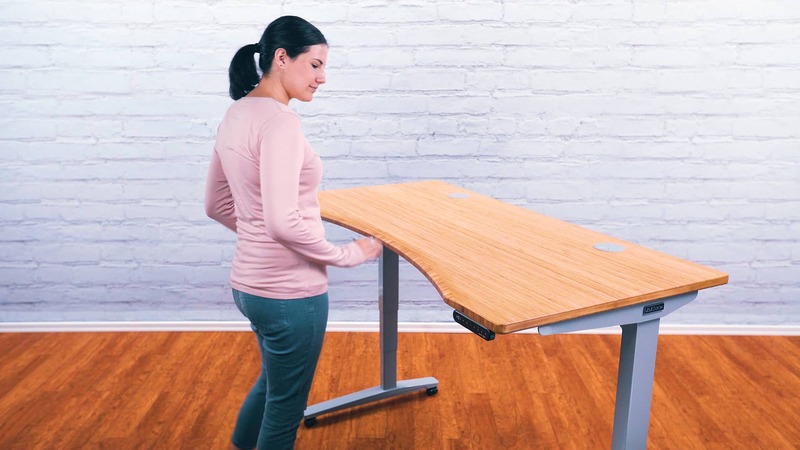 The UPLIFT height adjustable desk frame is compatible with any desk at least one inch thick. Our frames lift 355 pounds, and the telescoping crossbar accommodates desktops up to 90 inches wide and 30 inches deep. If you can build it, we can handle it. With frames available in 2-leg, 3-leg, and 4-leg configurations, we work with almost any size and shape desktop. And if you don't see what you're looking for, just ask our experts, and we'll find a solution. Our advanced digital memory keypad stores up to four heights, allowing you to switch between sitting and standing with a quick touch of a button. Your exact desk height is shown on a display that automatically goes dark to reduce power draw while the desk is stationary. This advanced keypad is an upgrade to the standard two-button up/down keypad. Standing all day puts stress on your body just as sitting all day does. We recommend you start your day standing, sit when your feet get tired, and limit sitting to 30 minute sessions. Most studies are now recommending 2-4 hours of standing per 8 hour day. As a bonus, you burn about 50 extra calories per hour when you're standing versus sitting. We offer a full line of ergonomic chairs and stools to help you take a load off throughout the day. And remember, with height adjustability, you'll finally get to work at perfect sitting and standing heights without compromise. We responsibly source eco-friendly materials. We feature 100% recycled wood desktops, bamboo desktops, reclaimed wood desktops, and GREENGUARD-certified laminate desktops. Each one of our desktops is finished in either a GREENGUARD-certified technique or in another non-volatile, indoor air-safe method. Our monitor arm beams and desk frame feet are made of 100% aluminum for optimal stiffness and the ability to be recycled. Everything ships free to any address in the United States, excluding Alaska and Hawaii. Rest assured that the price we list on sit-to-stand desks and accessories is the price you'll pay. For your convenience, we also offer delivery upgrades such as room of choice desk installation. Each order is checked for quality, packed with care, and shipped from our Austin manufacturing factory. We understand that your purchase means that you'll be enjoying your UPLIFT Desk for many hours per week. You're going to make us a large part of your work life and we'd like to return the favor. That's why our desks come with a free, industry-leading, 7-year warranty and around-the-clock support. We are here for you! Our desks work well alone and as a team. If your future office consists of four or more desks, we're here to help get you started with a little office design and space planning—completely free. Let our design experts configure the comfortable, productive, and beautifully-designed space of your dreams. We even have a collection of tried-and-true configurations to choose from, so you don't have to start from scratch. Let us know which of these designs appeals to you, answer four simple questions about your future office, and we'll have a configuration specially made for you in just a few days. Your custom layout will even include a discounted quote for your order.